At Encore Consign + Design, we have completely revolutionized how you shop for furniture. Our showroom in La Quinta spans over 23,000 square feet and is filled with some of the most beautiful, designer-inspired home furnishings and accessories in the Coachella Valley. Our team is eager to help you achieve your design goals and fill your space with elegant furniture with the convenience and economy of consignment prices. 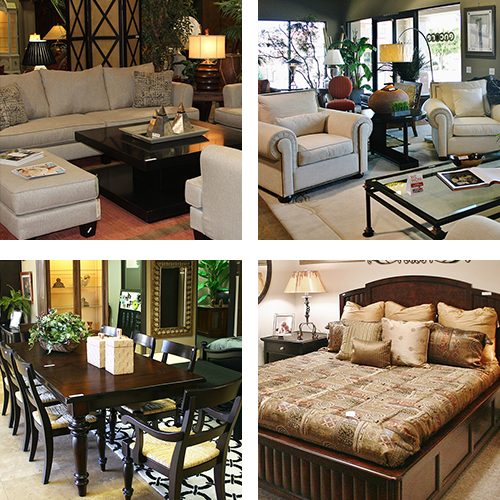 At Encore, consigning your luxury, gently-used furniture is simple. In just three simple steps, you can consign your furniture with us. Simply send a photo of the furniture or the home accent pieces you’d like to consign with us. Our team will assess your items to ensure the utmost quality and style and work with you to determine pricing and percentage. When you consign with Encore, you’ll have the ability to leverage our extensive marketing platform to ensure you find the right buyer for your furnishings. With little to no effort on your part, you can transform your unused furniture into cash, or trade it for something even better. Creating your dream home at Encore is simple. We have a vast showroom filled with elegant and practical furniture to help you create a stunning home at consignment prices. Unlike other consignment shops, we take the time to fully understand your design style and ensure that you find the best home furnishings for your home. To start creating your dream home without the hassle, we invite and encourage you to stop by our showroom today.